The Ruins of Us hits the ground running. Rosalie, an American woman married to a Saudi man, Abdullah, is shopping for a gift for her daughter when the shop-keeper casually asks if she enjoyed the anniversary gift her husband bought recently. Knowing that the gift was not for her, it doesn't take Rosalie long to find out that her husband has secretly taken a second wife, Isra. The after-shocks of this revelation are the real meat of the story as everyone in the family is affected. Rosalie must decide what to do whilst Abdullah hides behind the shield of tradition. Their daughter feels oppressed by the contradiction between her upbringing and the rigid rules for Saudi women but it is their son, Faisal, who is holding a deep resentment against his mother and her American-ness. As he becomes further drawn into extremist activity, events start to spin out of control.The Ruins of Us is an impressive novel that straddled several genres comfortably. 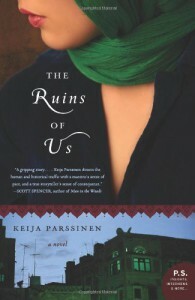 Different chapters in the book are told from the different perspectives of each of the main characters and Parssinen managed to make each voice distinct. I was particularly drawn to the story of Faisal as he became radicalised and this remained undetected by his family. Parssinen did a fantastic job of showing how bored, wealthy young men are often easy targets for extremists- in the news here it's not unusual to hear of young men from moderate, successful families ending up in terrorist training camps abroad, and I felt that this part of the story showed real insight. Faisal's guilt at being half-American was easily manipulated and used against him as he was desperate to become more Saudi and more Muslim. As his family struggled to deal with their own issues, no one noticed what was happening to him as he started to idealise poverty and suffering and rebel against his wealthy upbringing.Parssinen also successfully showed the emotions that each family member went through as they came to terms with Abdullah taking a second wife. I felt for Rosalie, even if I couldn't understand her choices. Having grown up on an oil reserve in Saudi Arabia, she was as much in love with the country as she was with Abdullah. There was also some good examination about what it means to truly belong somewhere, and to be caught between two very different cultures.One criticism I will make is that I wanted to hear more from Rosalie and Abdullah's daughter, Mariam. Whereas Faisal was rebelling by becoming more extremist, Mariam was busy fighting the strict rules for women in Saudi Arabia by decorating her abaya (outer covering worn by Saudi women) and writing an anonymous blog. These issues about life for women in Saudi Arabia were just touched upon through the characters of Mariam and Rosalie and I would have liked to see some more examination. But this is just a minor criticism - I thoroughly enjoyed this book and will look out for more by the author in the future.